Irish soda bread is a traditional quick bread that uses the reaction of baking soda and buttermilk as the leavening agent instead of yeast. Although typically associated with St. Patrick’s Day, I like to make this simple yet delicious bread year round. 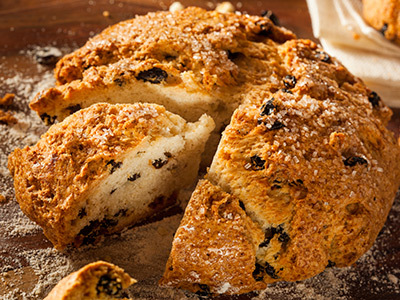 In similar fashion to a large scone, the raisins and caraway lend subtle sweetness and a distinctive flavor. For me, this bread is best served fresh baked and warm, with softened salted butter slathered on top. I think you will find a reason to make this bread all year round as well. 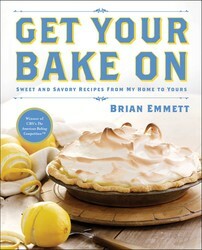 From Get Your Bake On: Sweet and Savory Recipes from My Home to Yours. Preheat the oven to 375ºF. Spray a baking sheet with nonstick cooking spray or brush it with vegetable oil. In a large bowl, whisk together the flour, sugar, salt, and baking powder, then blend in the butter with a pastry cutter or fork until the mixture resembles coarse crumbs. In a separate bowl, whisk together the buttermilk, whole egg, and baking soda, then add the wet mixture to the dry mixture and stir to combine. Fold in the raisins and caraway seeds. Turn out the dough onto a lightly floured surface and gently knead for about 5 minutes. Form the dough into a round loaf and place on the prepared baking sheet. Using a sharp knife, score the dough halfway down the loaf and brush the top with the beaten egg yolk. Bake until golden, about 40 minutes.